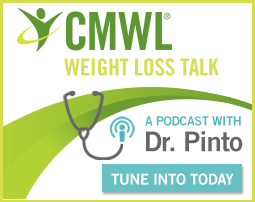 Click the link below to list to Dr. Pinto discuss the connection in the latest episode of CMWL Weight Loss Talk. Unfortunately, the increase isn’t too surprising. It’s consistent with our health trends over the past couple of years; unhealthy eating and lifestyle habits increase your risk for developing diabetes. The statistic that is surprising is of those with diabetes, 8.1 million, or 27.8 percent, are living with the disease, undiagnosed. Why should you care? If diabetes, which occurs when your blood sugar levels rise higher than normal, is left unmanaged, you can develop more serious issues like heart disease, stroke, blindness or kidney failure. The silver lining is diabetes is manageable if you receive proper care. Center for Medical Weight Loss providers are trained in weight management and nutritional counseling, two necessary components to prevent or manage diabetes. But you don’t have to wait until your first appointment to start making changes—you can start today! There are no drawbacks to making a positive change in your lifestyle. In fact, it will be the best decision you ever made. Practice portion control. Reducing calorie intake by controlling portion sizes is the focus for diabetic diets. Larger meals mean more calories, which can send your blood sugar levels through the roof. Meat and other proteins should be about the size of a deck of cards; nuts and raisins the palm of your hand; rice, pasta, and veggies the size of your fist; and peanut butter or cheese the size of your thumb. Avoid sweets. 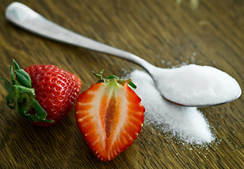 It may be a no-brainer, but sweets and diabetes do not mix well. However, you can find healthy alternatives to your favorite treats. Swap ice cream for sugar-free frozen yogurt or replace a full-fat candy bar for a small piece of dark chocolate, which isn’t as high in sugar and may reduce your risk for heart disease. Fill up on veggies. When you sit down for a meal, eat your vegetables first. If you fill up on fiber-packed veggies before tackling the rest of your meal, it will be easier for you to control your portions on the more starchy foods. You may not even crave a dessert! Opt for whole grains. High-carbohydrate foods like processed breads contain a hefty amount of added sugar, causing your blood sugar to skyrocket. Stick to whole grains like brown rice and whole-wheat pasta to get a dose of fiber that will keep you full and help prevent diabetes. When it comes to limiting the risk of diabetes, the first step you can take is weight loss. The process of losing weight begins with your mindset. If you can stay focused on why you began your personal weight loss journey and use the knowledge you’ve acquired, you can overcome any challenges you may face. In addition to the dietary changes outlined above, it is also important exercise regularly. Improved nutrition, increased activity, and behavioral change make up the formula for success. Because diabetes plays such a big role in the risk of so many other diseases, it’s important to take the steps to limit your risk.